Roger Eddy (R-Hutsonville), currently the Illinois State Representative in the 109th District, is running for the new 110th seat against Shelby County Republican Chairman Brad Halbrook. Did you get that? Brad Halbrook is Chairman of the Shelby County Republican Party. Eddy is the darling of the Chicago teachers’ unions and radical liberal Democrat Lt Gov Sheila Simon for his votes against school choice. It’s typical of a go-along get-along Republican like Eddy to make this kind of dishonest charge. 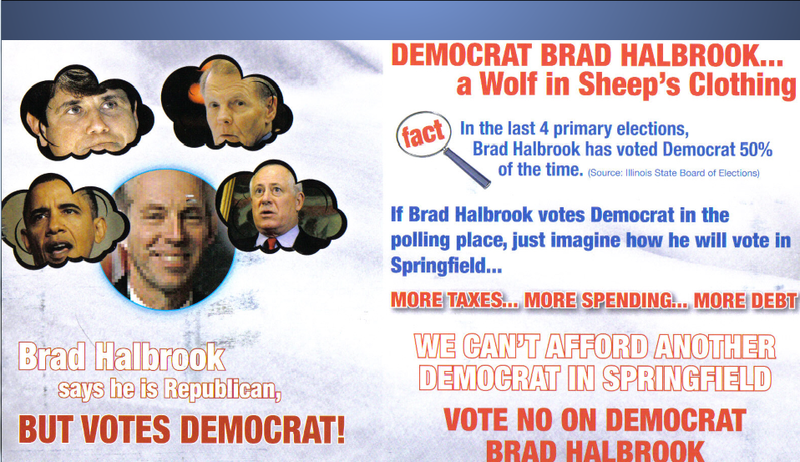 Brad Halbrook has sent out mailers noting, as his campaign has done, that Roger Eddy is hauling in over $250,000 per year in total compensation from his many sources of state and local government income.Eddy has responded by dishonestly calling Shelby County Republican Party Chairman Brad Halbrook a Democrat. Brad Halbrook has always been a Republican. But he is also a conservative, and his conservative beliefs are important. So when there was no Republican running in his area, he voted for the more conservative Democrat. And it was this very problem that pushed him into politics. He organized the Shelby County Republicans so that there would always be a choice. But Roger Eddy is desperate to go back to Springfield to cozy up with Lt Governor Sheila Simon and his buddies in the Chicago unions.